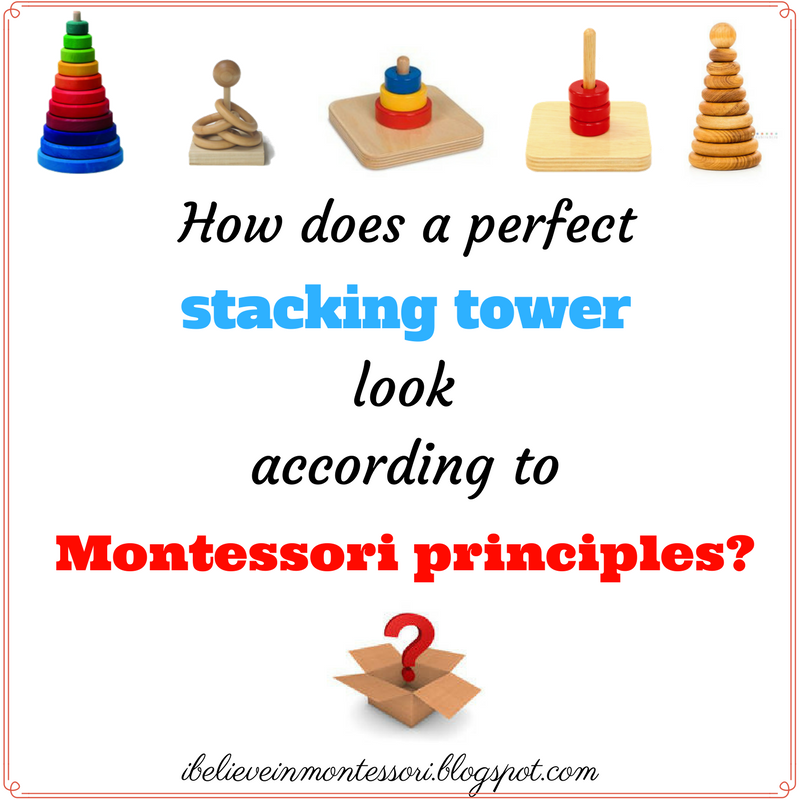 I Believe in Montessori: How does a perfect stacking tower look according to Montessori principles? 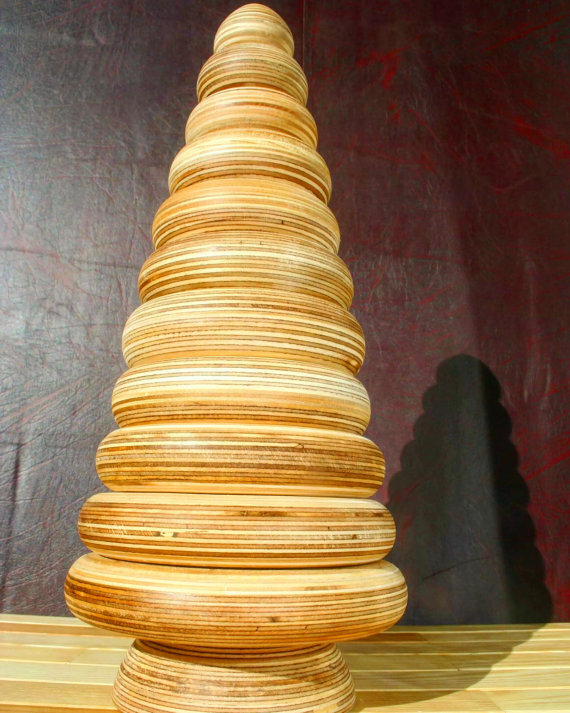 How does a perfect stacking tower look according to Montessori principles? There are lots and tons of different stacking toys out there. Many of them are called Montessori ones. Together with you today we will try to find a stacking tower that will correspond to Montessori principle. Also, I will write a bit about the sequence of presenting stacking towers to children. 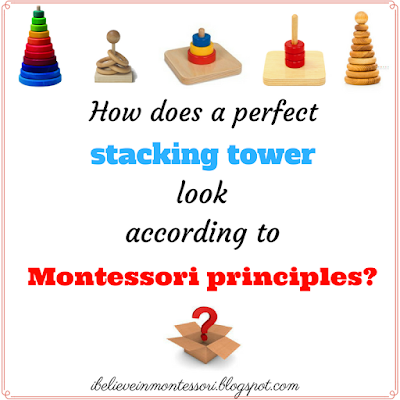 In fact, there are no stacking towers created by Maria Montessori herself exactly. She was mainly creating materials for children from 3 years. So no stacking tower can be called Montessori one. But we can look at them from a position of Montessorian. We can think about how many of them have qualities of Montessori materials. There are no standards but I would prefer wood. 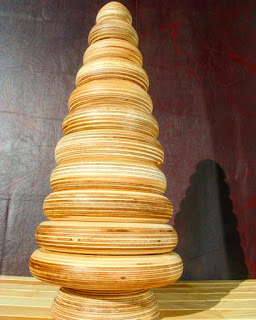 I think it is nice to touch and also it creates interesting natural sound when you stack it. But if you will find a plastic one that will be appropriate with colors that are not too bright - that would suit also. What qualities of Montessori materials should it have? - it should have one main and direct aim. I think the main aim is to teach a child to stack on the first stage and to teach him to form a tower from big to small on the second stage. - it should have the isolation of difficulty. It is a bit similar to the previous point. We distinguish one aspect of teaching from all the possible variations we can do with it. 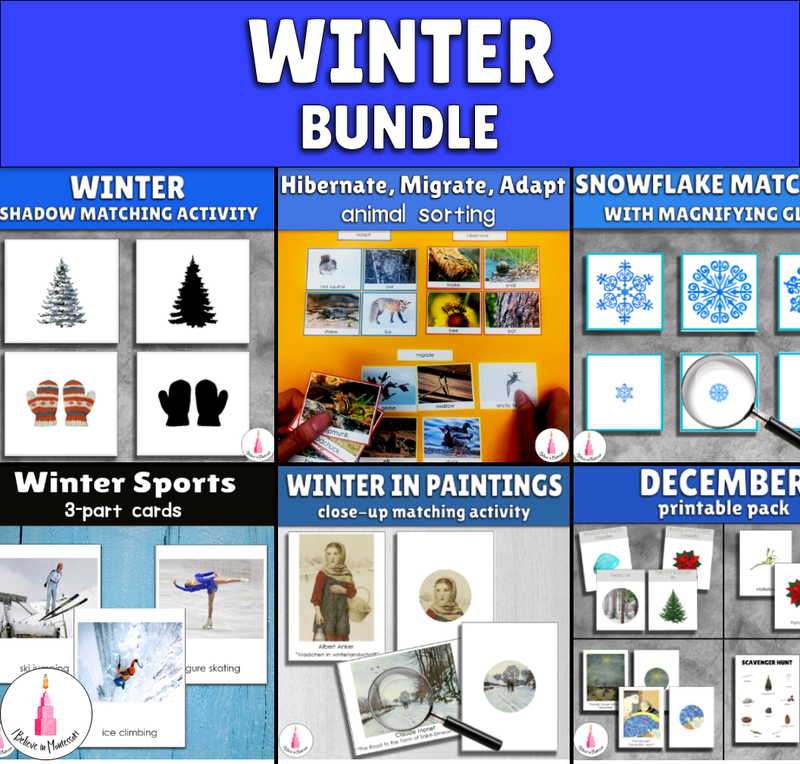 For example, if we want to teach a child to stack exactly we don't point to the color of the elements at the same time, we don't count them and we don't show different variations of putting it together. Now let's have a look at the sequence of presenting different stacking towers to the child according to his needs. I wrote "stacking tower" in google today and there are so many of them. I have chosen for you exactly those that correspond to our requirements. There can be many variations to the order of presenting these materials but I found this for myself. 1. The child starts using this toy at about 8-12 months. The holes in rings are pretty big so this fits perfectly to child's abilities at this stage. Here he learns to stack, develops his fine motor and hand-eye coordination. I like that this set has a big base so the dowel itself is very stable. All the elements are of the same uncolored wood. The rings are of the same size. 2. 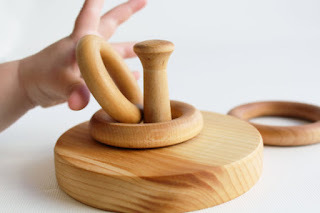 This toy is similar to previous one but it has the ball mounted on top of the wooden peg. This ball can help the child in the process of putting the rings on the dowel. 3. This one looks more like a traditional tower we used to see. 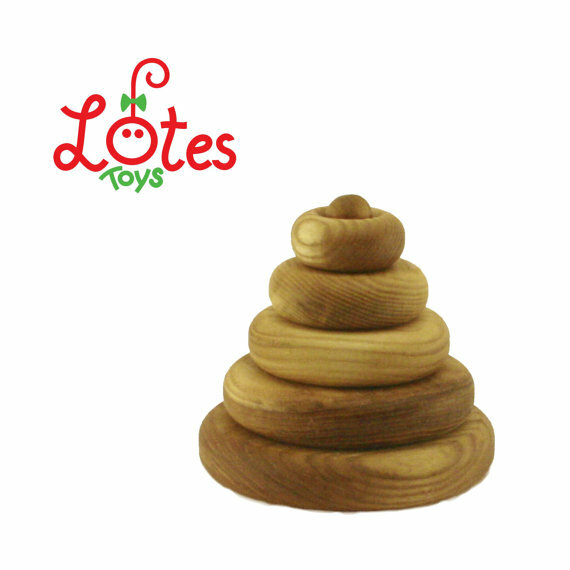 The child starts to use such stackers at 10-18 months. Here the size of the hole is smaller so the difficulty increases. This work needs more accuracy and precision of movements, coordination, and dexterity. 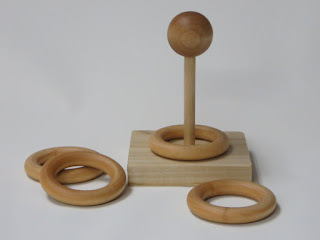 It helps the child to develop his grasp and hand-eye coordination. Again the base is big so the tower can not fall while forming. Here we can see that nothing will distract the child from the main aim not the size of the rings nor their color. 4. This is the next stage of stacking. Now we use blocks. It develops another type of the grasp. 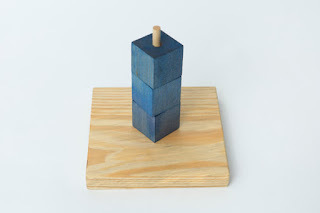 This stacking tower isolates the particular skill of placing the block on the dowel by keeping the shapes, sizes and colors constant. Such materials also develop concentration, attention and fine motor. 5. 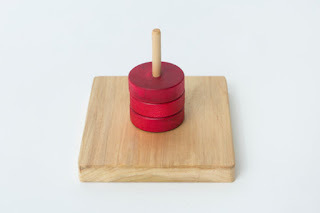 Now when the child has learned to put discs on vertical dowel the difficulty increases. 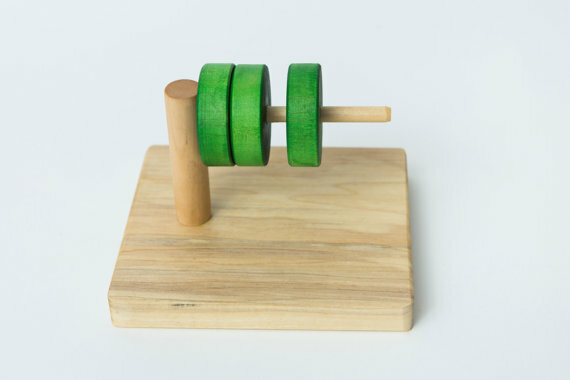 This horizontal dowel helps develop a slightly different grasp than a traditional stacking toy. It enhances child's fine motor skills. 6. The difficulty increases again. 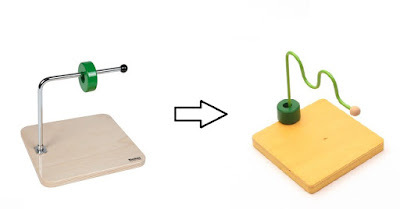 Now a child needs to thread discs on a metal horizontal wire. It is thinner than a wooden one the work is more challenging. We start with straight wire and then move to the bent one. These materials provide development of different hand and wrist motions. 7. The child has mastered all the different types of threading with various stacking toys. Now he is ready to progress to stacking by color. Here he needs to place a correct ring onto a matching dowel. The child starts to work with this material at 18-24 months. It helps the child to learn 3 primary colors. As you can see all other qualities of the material are the same, such as shape, size, material and texture. So the child's attention is concentrated only on the difference in colors. I think this is a kind of a variation for stacking work. 8. Oh, that was hard to find exactly this one! All the thing proposed are of different colors. I am happy I have finally found something I had in my mind. It would be perfect for me if there would be 3 rings. 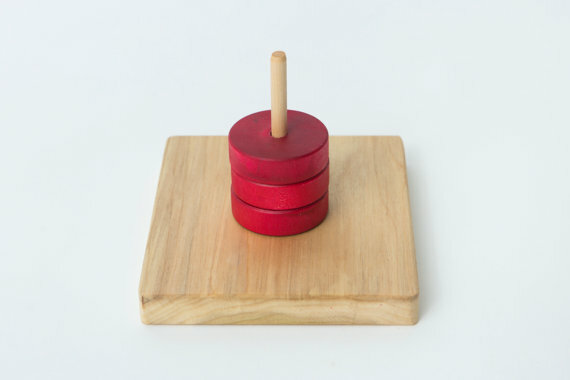 So here our aim is to teach a child to stack from big to small. Here we start teaching about big and small, bigger and smaller. In this work, child starts to develop the understanding of harmony that he will later continue to discover with pink tower and brown stairs. You see that here the child concentrates on one quality of the material that changes, that is the size. All other characteristics are the same. It should not be specifically uncolored wood but all the elements should be of the one color. I just didn't manage to find another example for you because it is quite a job to find a small monocolored stacker. I was taught that in the 0-3 classroom we use things with 5 elements and in 3-6 with 10 elements. Number ten correlate in the 3-6 classroom with many other Montessori materials. I think is rule works for stacking toys also we start from 1-3 and go to 5-10 rings. These are all the stacking towers that I consider correspond to Montessori principles and Montessori materials qualities. To my mind, it is impossible to name just one perfect stacking toy because as you see they teach different skills and have different aims. But this is my list of the things that fulfill the aim of the material in the best way. 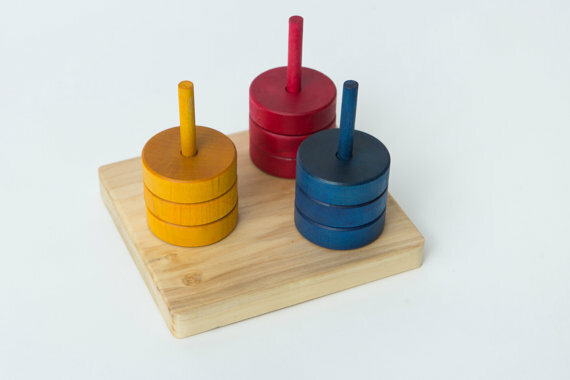 In Montessori gift guides recommendations we can often find colorful wooden stackers. I know they are very beautiful. But we should not call them Montessori. Not all the wooden toys are Montessori ones. I am not against colorful toys, for example, I can imagine the variety of uses for a colorful rainbow. But with the stacking colorful tower, what is the purpose of it? What is the aim? I think sometimes we buy children colorful toys because these toys appeal to us and we think that child will be bored with plain color. But they will not. We need to think whose needs are met with this specific toy? Can we use other towers? Sure we can. We just don't need to call them Montessori. A lot of things I showed you here can be DIYed in some original and interesting way but with saving of their important qualities. In this post, I wanted to share with you how Montessori principles are used for choosing materials. I hope this will help you in some way in your teaching and parenting. What a fantastic article! I love how well you explain Montessori principles. Articles like this really remind me of what I love so much about Montessori - it's so simple, but logical, too! This was a great article. I like the way that you've identified a sequential pattern of materials involving one changing attribute. I'm excited to try some of these in new variations in my home! Thanks for sharing such an informative post..,I have purchased a Stacking toy for my baby from sophielagirafe couple of weeks ago as a birthday present.This is a Wooden stacking pyramid with 8 pieces. My baby loves playing with it..